If one listens to music with a sense of discovery and adventure for years, one sooner or later comes across musicians and composers who for whatever reason are not well-known to the general music-loving world, yet repay your listening attention with worthwhile fare. Such a person is composer Gerhard Frommel (1906-1984), most specifically in a new recording of his Piano Sonatas Nos. 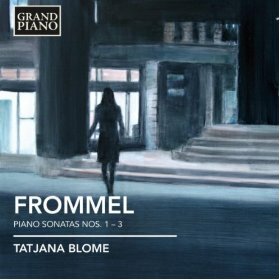 1-3, performed by Tatjana Blome (Grand Piano 606). Part of the reason may well be that he did not follow the avant garde tendencies of his era. His music does not veer toward atonality, there are no 12-tone rows to be found, serialism is not a factor. But one does not feel a lack of any sort when listening. The piano sonatas on the disk at hand are well put-together, inventive examples of idiomatic modern piano music that abound in thematic material of an attractive sort, pleasing developmenal passage work and a memorable quality in general. His music is not anti-modern. I hear elements of Stravinsky's rhythmic drive and melodic singularity, a bit of the whimsy of Satie, sometimes a bit of the abstract modulatory harmonic quality of Hindemith, impressionistic elements. . . this is not the music of a reactionary, nor is it a hodgepodge or pastiche. Frommel's sonatas have a maturity of voice and sense of eventfulness that tempt me to call out the name as a discovery, a neglected voice, someone whose reputation needs reviving. Alas for now all I have to go on are these three very charming sonatas, played with sympathy and sensitivity by Ms. Blome. Regardless of what the rest of his music may be like, surely the Frommel of this recording will find a welcome among those who love the music of the 20th century and do not mind going off the traveled road to find something. That this is. Recommended. 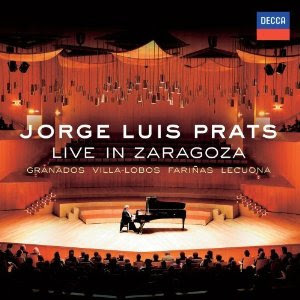 Cuban pianist Jorge Luis Prats made quite a name for himself 30 years ago as an artist of great promise, then virtually disappeared. It turns out he chose to remain at home with his family rather than embark on a world adventure that would have put him in a semi-exile situation. He is back after all this time with touring and a rather stunning recital recording, Live in Zaragoza (Decca 00289 478 2732). The self-imposed seclusion has not diminished his talents. He embarks on a program of Spanish and Spanish-American classics with dash and a beautiful flamboyance fitting to the music. The two disks cover his renditions of Granados's "Goyescas", Villa-Lobos's "Bachiana brasileira no. 4 for piano," and then a second disk of encores covering Farinas's "Alta Gracia," Cervantes's "Danzas cubanas," and Lecuona's "Malaguena." He has a beautifully dynamic rubato style, a flair for dance rhythms, a wonderful touch and an interpretive way with the pieces that brings out the salient aspects of each passage with a poetic grace. This is bravura pianism from start to finish. Welcome back, Maestro Prats. Today we look at something that came out late last year, by a composer who may not be fully known but nevertheless writes music of merit. 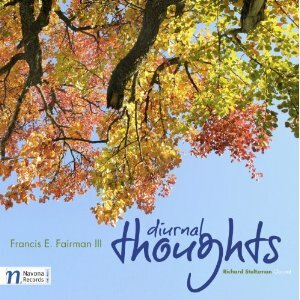 Francis E. Fairman III's Diurnal Thoughts (Navona 5863) contains four of Fairman's orchestral works: "The Fox," "Diurnal Thoughts," "New York Taxi," and "Concerto for Clarinet" (with Richard Stoltzman as soloist). Judging by these pieces Fairman writes tonal music of a tone-poem-painting, descriptive sort, perhaps a bit on the impressionistic side, music that well could have been written 100 years ago and not seemed outlandish by contemporaries. That having been said, there is charm in this music, and light-heartedness. Stoltzman does a fine job with the Concerto and the music is generally well-played by the Slovak Radio Symphony, the Moravian Philharmonic, and the Warsaw Philharmonic. This may not be essential to your modern orchestral collection, but it makes for a most pleasant diversion. Ever since John Cage's "Sonatas and Interludes" and selected other works, the prepared piano has been a part of the modern concert music landscape. Lately especially there seems to be a surgence of compositions for the altered piano. 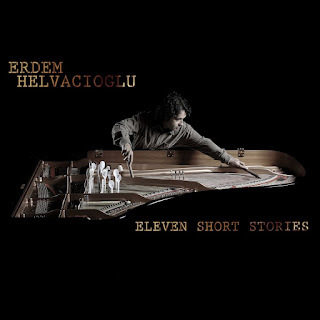 One of the very best is Erdem Helvacioglu's Eleven Short Stories (Innova 245), an 11-part suite for the instrument that includes various sequences for the conventional sounding of the prepared piano plus a variety of inside-the-piano playing techniques. The music is less of the percussion-orchestra-in-a-box that Cage so brilliantly favored in his Sonatas, and more a meditation on sound color, a soundscape for the instrument with evocatively quiescent soundings that relate to the Satie-Cage-Crumb exotic-lyrical lineage, as the work nicely establishes Helvacioglu's contribution to that general line of musical thinking. And as the press sheet notes, there is a mutual resonance between the instrument's possibilities, the composer's sensibilities and his Turkish roots. It's music for a rainy day, a sunny day, a brown study. The suite's titles suggest a series of short stories that make the music a kind of soundtrack for life's experiences. Your life's experiences, if you open yourself up to the music. An excellent diversion that succeeds on a purely musical level as it forwards sound poetry of rich associations. Anton Dvorak. Nearly everyone learns to pronounce (or mispronounce) his name in connection to his "New World Symphony." That is, in the States. I have a friend who was at one time a cashier for Sam Goody's, a retail NY Area record chain who at the time were full-line oriented. One of the questions they asked him in the interview was, "Who wrote the 'New World Symphony'?" Presumably a vacant stare, the answer "Beethoven" or "DI-voRACK" might have cost him a job, but he knew. Of course Dvorak did a great deal more in the way of good music: numerous other symphonies, string quartets, solo piano works, etc. Then there are his lieder. They aren't as well known but are quite nice. Harmonia Mundi is releasing this month a selection of Zigeunerlieder, Songs & Duets (Harmonia Mundi 90281). 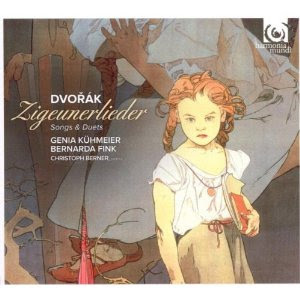 Soprano Genia Kühmeier holds forth on the "Ziguenerlieder" (Gypsy Songs); mezzo-soprano Bernarda Fink puts her personal stamp on the "Biblical Songs;" both perform the "Moravian Duets." Christoph Berner provides sensitive accompaniment on piano throughout. The Duets were well received when introduced and helped Dvorak get early recognition. Kühmeier and Fink sing them with great charm and spirit and they are quite worthy of our appreciation. 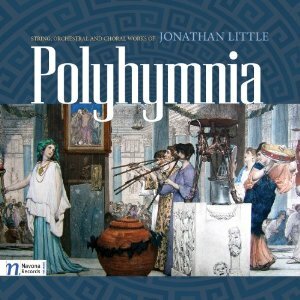 The Gypsy and Biblical songs are somewhat more straightforwardly romantic in compositional execution, but do have much appeal. In the hands of the performers they come alive. The thought expressed in Friday's review, that we currently enjoy a period of experimentation and innovation in contemporary concert music, continues on today with new music by Todd Reynolds, as heard on his recent 2-CD set Outerborough (Innova 741). In this case we have as on Friday's Ethel recording the incorporation of rock and world music into a quasi-post-minimalist modern concert stance, but also a bit of electronica, what sounds like improvisation and, perhaps most importantly, live electronics. The advent of the laptop computer and live electronics software like Ableton Live has opened up avenues of expression that the virtuoso violinist and music thinker/composer Todd Reynolds has capitalized on. The CD set covers a wide terrain. CD I centers around Todd's own inventions and compositions. He plays violin, of course, but also viola, electric guitar, electric bass, and kick drum, and vocalizes as well. It's cushioned and forward by a live electro-acoustic environment that creates multiple effects and allows Todd to build chamber and quasi-orchestral densities of voices, partly by loop-building means, partly I assume by multiple tracking. The results are fascinating--moving, very musical short works that travel along with rhythmic-dynamic momentum and yet have a kind of transcendent lyricism thanks to Todd Reynolds's beautiful violin playing and fertile invention. The disk closes with "Icy Sleeves of Green Version 2.0," his memorable recomposition and improvisation around the beautiful old standby "Greensleeves." Disk Twe realizes performances of compositions by Todd plus an illustrious gathering: Phil Kline, Michael Gordon, Paul de Jong, Michael Lowenstern, David T. Little, Nick Zammuto, Ken Thomson, Paula Matthusen, and David Lang. These are pieces where Todd gets involved in collaborative efforts with the composers, both on the strictly compositional level and in terms of production and added instruments, depending on the piece at hand. The music here too engages but often in ways that show the varying intentions and musical goals of the collaborators and understandably is not as unified in overall thrust. Nevertheless there is much to explore and much of it is very good. All of it is thought-provoking and exceptional, each in its own way. I hear that Todd Performed at the indie rock festival SWSX in Austin this year. That's of course an indication of how the music should and does appeal to those outside the strictly classical claque, as well it deserves. The album is an important one--very accessible yet very new. It's something any musical listener should appreciate. Bravo. We are in a period of experimentation and flux for modern concert music, no less so than in the '60s if you look for it. The Kronos and Turtle Island String Quartets have experimented for some time with the incorporation of rock, jazz and world musics (with their handmaiden minimalism) into the quartet repertoire. 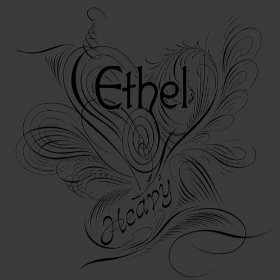 The quartet Ethel is another one of the groups that has dedicated themselves with success and acclaim to the new explorations and they give us their latest traversal of unusual works in this vein on their release Heavy (Innova 820). This is their third album since their formation 14 years ago. It's a wildly unpredictable ride through the newest new compositions by Don Byron, John Halle, Julia Wolfe, John King, Raz Mesinai, David Lang, Kenji Bunch and Marcelo Zarvos. Heavy is well-named. The music sometimes has the weight of amp-overloading metal, with insistence and torque. Other times there are lighter, more ethereal sounds to be heard. Blues-rock-ethnic tonality spiced with dissonance and tonal/textural contrast, repetition and change, themes taken from Thelonious Monk and Marvin Gaye, and a general post-classical attitude are what you hear and feel. It's bracing, it's healthy, and the quartet plays with edgy brio and subtlety combined. It is what New York is, the center of creation (if you'll have it) where anything goes if it is done well. And this is a fine example of the now that New York remains. And it is done well. Very well indeed. I know nothing about Allen Bonde. His album of compositions, Sound Spectrum (Navona 5862), is my first exposure to his music. It's a set covering some of his song output plus piano and orchestral works. Stylistically Bonde generally works within certain established parameters. The songs are within a kind of tonal approach reaching from the more conservative aspects of Ives through to some of those who followed in his wake. I found myself slightly at odds with the Elizabethan lyrics he has made good use of and the vocal style of the soprano, apparently his wife. They are stylistically polyglot, in that she is singing with a full near-operatic flourish and/or cabaret style that I find difficult to get past to the music itself (which seems better suited to a simpler vernacular vocal style) and its relation to the lyrics. The "Fantasia for Piano and Orchestra" is another story. It is well crafted and the piano solo part has a kind of vivacity that appeals. His piano writing in the songs and the solo piano pieces show a side of his music that I find to be well wrought and engaging. The post-romantic through modernity stylistic spectrum gets attention and shows his musicality in the best light. It's his "Symphony No. 1" in two movements that I find I especially like. It is a goodly modernistic excursion into ambiguously tonal territory, sometimes with a kind of mysterioso cast but with contrasting bold strokes in wind, brass and strings. 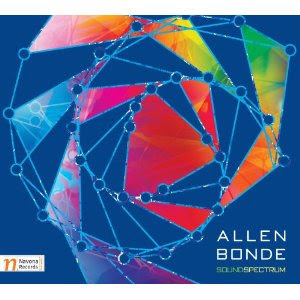 All-in-all Bonde shows himself to good advantage on Sound Spectrum. The orchestral and piano works are worth hearing. The songs I have mixed feelings about. I wish him well. Maurice Ohana (1913-1992) studied with Alfredo Casella and made France his home base for most of his career. Though he is one of the lesser-known European composers of his century he most certainly deserves recognition. And there is evidence that he is beginning to get it. A careful listen to the recent Complete Piano Music, Volume 2 (Telos 091) demonstrates this in fine fashion. It consists of a major solo piano set from 1982-85, the "Douze Etudes d'Interpretation," played by Prodromos Symeonidis. This is sublime, complexly modern piano music with a certain trace of the searching mystical quality of Olivier Messiaen, especially in the irregular rhythms and some of the voicings. Promodos Symeonidis plays the 12 etudes with assurance, a sense of phrasing that brings out the musical contrasts well, and a poetic bearing. He is joined by percussionist Friedemann Werzlau for the last two. It is music that needs your attentive ear for at least several hearings before the logic of the musical architecture and the expressive expansiveness of his pan-tonal/expanded tonal language becomes familiar and comprehensible. You are rewarded in the end with masterful work that is played with concentrated, concentric inspiration by Maestro Symeonidis. Beautiful! The blog covered Volume One of Pacifica Quartet's The Soviet Experience in a posting of this past October 31. 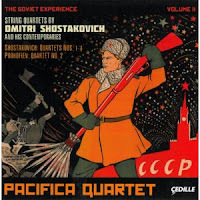 Volume Two is now out, again a 2-CD set (Cedille 90000 130), and it continues the definitive performance affinity that Pacifica has developed for the Shostakovich Quartets. For this volume we have his Quartets Nos. 1-4 and also Prokofiev's Quartet No 2. Needless to say they work well together as a program. As before the Pacifica Quartet shows a tremendous verve in the fortissimo-allegro movements, a contemplative somberness as appropriate on the quieter andante and adagio movements. The Prokofiev Second Quartet has not been recorded all that often and is a welcome addition to the set. 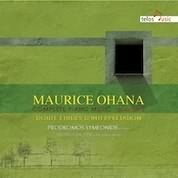 Perhaps most remarkable factor in these Pacifica recordings is the subtle shifts in mood and articulation throughout. The quartets are complex masterpieces that can sound like peasants merrily threshing hay in one moment and a cloudy horizon the next. The Pacifica Quartet brings out the subtle nuances along with the bold strokes. In that they are virtually unsurpassed. Alfred Schnittke (1934-1998) is not a composer one can easily pin down. Unlike his contemporary Arvo Part, for example, who writes with an unmistakable signature style in much of his mature work, Schnittke combines old and new in various ways. His "Zwolf Bußverse" or "12 Pentitental Psalms", completed in 1988 and available in a new recording by SWR Volkalensemble Stuttgart under Marcus Creed (Hanssler Classic 93-281), utilizes a mixed choir in music that has the starkness of Orthodox chant and other old forms, yet also utilizes an expanded harmonic vocabulary and dissonace as part of the overall pallete of sound for expressive means. It's a work that is performed beautifully by the SWR choir with a buoyantly live sound staging. All that later Schnittke was is there, complexity-in-simplicity, music both of and out of its time, the adroit handling of voicings. It's without a doubt one of his most compelling choral works. 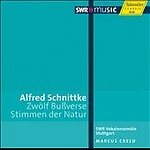 The album rounds out with a short "Stimmen der Natur" (1972) for 10 women's voices and vibraphone. You can hear him working his way though the modernism of his time towards something the Psalms bring to life fully. Recommended for all Schnittke admirers and those who want to get a grasp on the full spectrum of "post-" classicism in its full flowering. 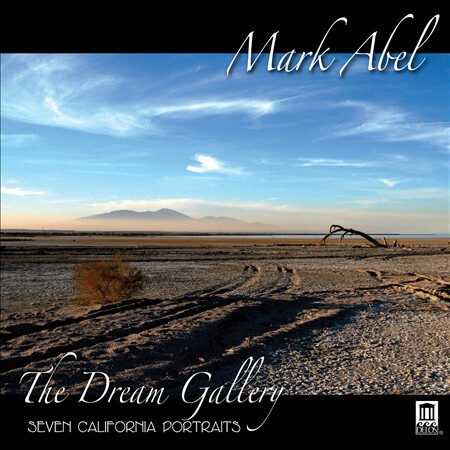 Mark Abel's The Dream Gallery (Delos 3418) has come out on CD. It is subtitled "Seven California Portraits," and that involves a "libretto" text centered around the stories of seven separate individual personalities from different regions and socio-economic strata of present-day California. Each person takes the "stage" one by one in seven movements for vocal soloists and orchestra, and tells of his or her life and general disenchantment with it. The text has the people sing about their disappointments, emptinesses, losses and dilemmas in a local America that has not lived up to their expectations. In that it is a musical story of the recession, and one of the only concert pieces I can think of that takes on this period of our history at this juncture. That it does so from the standpoint of seven sometimes rather confused average-Joe types is I suppose what makes it so engagingly immediate. The music has a kind of "high-toned" symphonic quality, in some ways a transformation of the Broadway musical to concert music. It's contemporary in a mostly diatonic, post-minimalist way, with some rather excellent tone-painting settings of texts--something that Benjamin Britten did so well--along with a hint of Steve Reich's minimalism, a Zappa-like flourish now and again, not to mention Michael Nyman's and John Adams's operatic treatments as predecessors. It is that I hear more than a rock-symphonic synthesis per se. I only mention this because the CD cover goes on a bit about how, finally, here we have a successful amalgam of rock and concert music. Frank Zappa did that in a number of works that deserve to be more widely heard. Mark Abel does not, really. I hear little to no rock, unless one uses that word to determine a category of music that does not include jazz, country, rap or classical. There's something perhaps of the singer-songwriter's craft here, the post folkie phase--and the modern art song that came out it, without the verse-chorus structure but instead with a contemporary operatic horizontality, if you will. Other than an occasional momentary illusion to rock, I don't hear the connection, unless it be with the most symphonic aspects of progressive rock, which were more symphonic than they were rock to begin with. In the end all that does not matter. It does not matter because the music is compositionally/orchestrally strong and well-performed. It involves some very accessible, serious symphonic song crafting, a contemporary opera without costumes and props. The music appeals. The texts have their charm, but what should be hard-hitting sometimes seems self-indulgent. One young lady sings about how the Baby Boomer generation developed cosmic consciousness while they let the planet fall apart. And, she goes on, if you think we're going to continue to support social security, "fat chance." I found that offensive and a little too pat, not to mention a bit redolent of what the extreme right would have us believe. Blame everything on the hippies (among others) and get rid of the social programs so we can recreate the world of robber barons, with an ever enlarging gap between the haves and the have-nots. Well of course this is supposed to be a series of real-life slices of life, and I am sure there are those out there who think that way. I won't comment further. Nevertheless I don't appreciate the intrusion of far right-wing politics into my art-music listening, even if it is supposed to represent a California (stereo)type. It doesn't come off as parody. It is deadpan. So be it. Otherwise the stories can be quite moving at times, with their well-conceived musical settings. 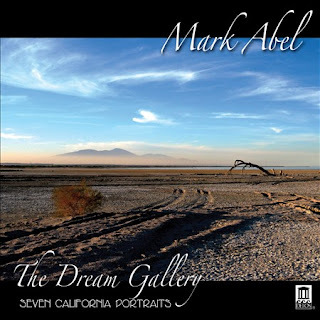 Nonetheless Mark Abel has crafted a thoroughly contemporary, excellently written work that is a joy to hear. The soloists and orchestra do a terrific job with the score, and no doubt it could be considered a triumph. In composer Jonathan Little we have a voice. His music is tonal and filled with color. There are ostinatos and repetitions to be had now and again, but there is a forward momentum that at times combines with mystical suspensions that remind a little of Arvo Part and John Tavener (the present-day English composer, not the early music John Taverner); other times there's a folk element latent in the music that I suppose you could put in the lineage of Vaughan Williams. "Polyhymnia" and "Sacred Prelude" for string orchestra are examples of the former; the orchestral opus "Terpsichore" of the latter. The choral "Kyrie" has an early music element with a sonic modernism. These four works and the short "Fanfare" can be heard on the recent album devoted to his music, Polyhymnia (Navona 5867). The performances are decent for the most part, the music dynamic and dramatic. It's a composer who is young enough that we can expect to see further development. This collection of works shows that he has much promise and potential. As it is the music puts one in a place worth being. Back when almost every home had a piano and it was fashionable for young ladies (and young men sometimes) to get some accomplishment on the instrument, the repertoire for solo piano included pieces that the middling to well-grounded amateur could play in the home without too much trouble. Music publishing catered to such clientele and a popular, not too hard piece could sell well. Times have changed, of course. The Victrola, radio, television and all the rest slowly ate into the general piano ownership/playership situation. Far fewer homes have them these days and subsequently far fewer amateurs are out there to play the music. A composer of solo piano works, especially those in a modern mode, does not rely upon sheet music sales for the most part and often composes the music for a more professional player and a changed playing situation. 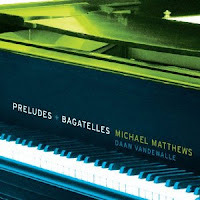 So when I received composer Michael Matthews' Preludes and Bagatelles (Ravello 7819) solo piano CD in the mail, I knew that normally the recorded medium is the principal source of dissemination for such music, and appreciated all the more the act of composing such music in today's world. As it turns out Michael Matthews has written some very evocative works. Daan Vandewalle performs the 21 brief works with a poetic charm. There are six of Matthews' Bagatelles, 14 Preludes and a Postlude. It's music of an expanded tonality, at times demanding a good amount of technique but above all a sense of creative rubato and a keen, intuitive ear for the overall musical trajectory of each work. There are passages that have a turbulent passion to them and those more relatively placid and introspective. 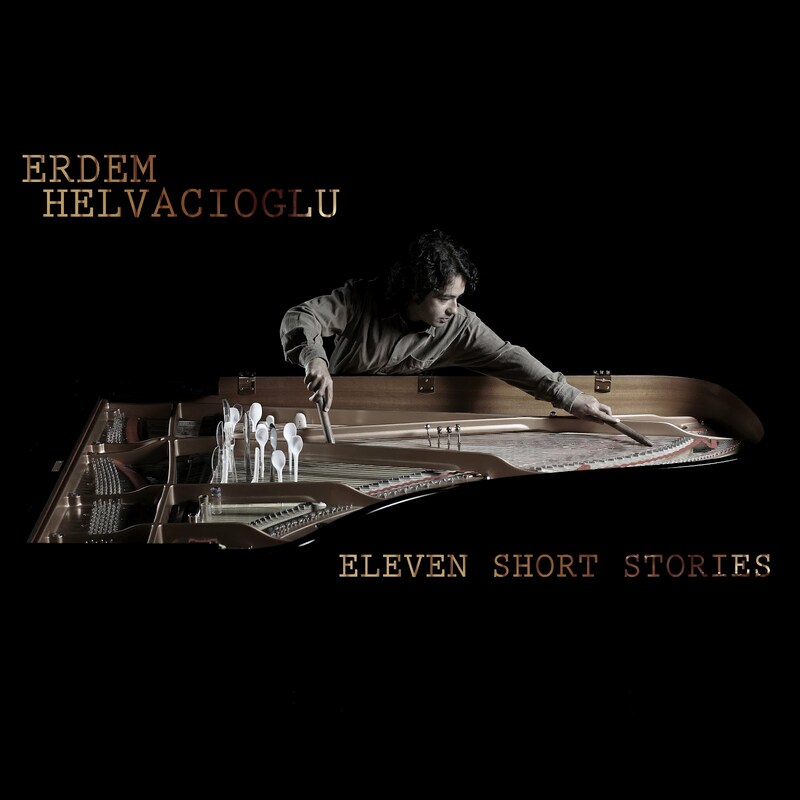 They flow together well and leave an impression of a composer who has absorbed the solo piano tradition of the late romantics, impressionists and early modernists to come up with his own synthetic, personal series of musical utterances. Here is a composer of talent. If you love the modern solo piano repertoire Preludes & Bagatelles will be a most welcome addition. I have no doubt I will return to this one many times in the years to come. Things Mayan have been on people's minds since the story came out that the end of the world was predicted for this year according to their calender. Of course one might say they overshot the mark since Mayan Civilization in its classic Empire phase ended some time ago. However there are people who are susceptible to thoughts of the end, and so it gets talked about. I do not know enough about it to speak further, nor is it my place here to do so. Nonetheless no doubt there is much to know about what the Mayans believed, what their cosmic world was like. Composer Jeremy Haladyna has immersed himself in this and continues to create music based on what he has learned, which he calls The Mayan Cycle. 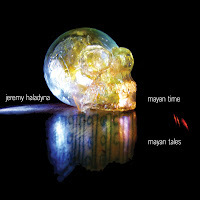 The second installation of said cycle is to be had on the new CD Mayan Time, Mayan Tales (Innova 818) and I've been listening to it with interest. The press sheet tells me that the music contained here is fomulated according to "Mayan notions of time reborn as scales. And atop the scales, tales...." The time alotted to me to address music before seeking renumerative compensation precludes my immersing self and reader in the intricacies of all of this. I will leave that for the listener with time to do so. There are seven sections to this part of the cycle. Each has a distinct ambiance, subject and instrumentation. I've listened all along without recourse to the programmatic information that the composer provides. There is much to be heard of note, meaning attached or no. The first three movements have to do with the "Princess of the 9 Cave," and feature electronics and four-hand marimba. Movement four is for solo piano. Movement five, "The Crystal Skull of Lubaantun" is an electronic soundscape. The sixth, "Jaguar Queen" is scored for amplified soprano, singing in Yucatec Mayan from a traditional text, accompanied by piano and two percussionists. It sounds a little George Crumb-like. The soprano eventually strikes up a refrain similar to "Santa Lucia" and the marimba players pick up on that towards the end. The seventh movement has some dramatic music for organ and oboe, a sonorously striking combination. The final movement, "Xtaj," is for amplified piano with effects, including apparently the overlaying of metallic objects over the strings of part of the piano for a richer percussive bite. There again I hear a Crumb influence in the use of space and reverberant semi-prepared piano. There is something more to it, however, that is Haladyna-esque. The phrasing can be denser, the rhythmic aspect more compact and actively turbulent. Aside from the programmatic elements, this is a suite of widely diverging musical combinations and sounds. It is post-something (post-modern?) (or is it post-pre-modern?). At any rate Haladyna's musical personality comes into play as an eclectic but adventurous soul who, while getting at the heart of his Mayan explorations, gives us a wide-ranging, pleasingly sonorous set of musical vignettes charged with Haladyna's own brand of Mayan-ness. Sprezzatura as defined in music has to do with a combination of expressiveness and freedom of tempo. 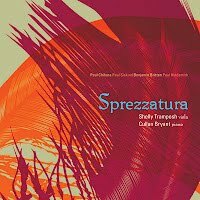 Sprezzatura (Ravello 7818) is also the title of a recent album by Sally Tramposh (viola) and Cullan Bryant (piano) of a selection of modern works (for viola and piano). The album contains world premiere recordings of Paul Chihara's "Sonata for Viola and Piano" and Paul Siskind's "Etwas fur Bratsche (etwas rasche!)". Filling out the program are Britten's "Lachrymae" and Hindemith's "Sonata for Viola and Piano". The title of the album seems apt, as Shelly Tramposh's solo style is, somewhat like the late Joseph Szigeti on violin, concerned a bit more with expressiveness than beauty. So she turns out to be well suited to the Hindemith, for example, which is more dramatic and stirring than lyrical and sweet. The same could be said for the Britten. The Chihara and the Siskind are perforce new to us in recorded form, but Tramposh and Bryant bring out the bittersweet qualities of the former and the chromatic dash of the latter in good ways. Cullan Bryant sounds equally expressive throughout at the pianoforte. In tandem the two make a worthy interpretive statement on each work. I've heard the Hindemith played somewhat more heroically, but the Tramposh-Bryant team define it more distinctly as a work in the expressionist-modern camp, where one might say it belongs, and which makes for a nice contrast to some of the other readings on disk that I am familiar with. In the end we have recorded premieres of two works quite worthy of hearing and some distinctive interpretive takes on the Hindemith and the Britten. The Chihara premiere alone would make it worth hearing. But of course there is considerably more here as well. And there is indeed much sprezzatura to be had in these works as performed. One of the things I like about my music writing is that I get the chance to be exposed to composers and works that I probably would not have gotten to hear in previous years. That means I get a pretty good look at what is emerging today. Keith Kramer's music is a case in point. He composes, plays guitar, conducts and is an audio engineer. 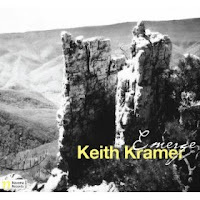 The 2-CD anthology of his music, Emerge (Navona 5859) gives you an in-depth look at his compositions, going from solo piano to chamber to orchestral and back to small chamber configurations again. Kramer writes in a modernist vein, meaning that there is harmonic sophistication of the pan-tonal, advanced tonal sort. I won't say atonal because there seems to be a centered tonality at the basis of the music. At any rate the music sounds rather modern-American at the same time as there are Darmstadt and post-Darmstadt elements. In other words his music does carry with it a synthesis of some of the stylistic tendencies of the last 100 years. However from that a picture of a distinct musical personality emerges. His alternation of turbulence and repose at times stands out; a highly developed melodic-architectural sense does as well. It's music that takes some time to absorb. It is music that bears the stamp of thoroughgoing high art. Repeated exposure bears distinct rewards. 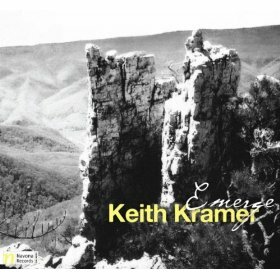 If you are looking to champion a relatively unknown present-day modernist composer, Keith Kramer is one that seems deserving. Listen to this anthology and you'll hear why. When Paul Hillier turns to the choral music of Arvo Part, one anticipates the results with expectation. Maestro Hillier has a way with Part's music; the idiosynchratic modern-early music amalgam that is so much a part of Part finds an ideal interpreter in Hillier. 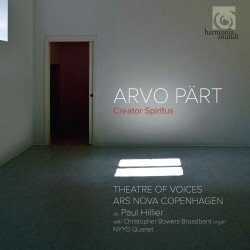 A new volume of choral works, Creator Spiritus (Harmonia Mundi 807553), will be out in a few days. Paul Hillier, his choral ensembles Theatre of Voices and Ars Nova Cophenhagen team with the NYYD Quartet and organist Christopher Bowers-Broadbent for a program of mostly brief works covering all stages of the composer's career. Much of the music has the upward-reaching cosmic sacredness for which Part is known and revered. Other than the beautifully open 26-minute "Sabat Mater" they are in miniature form. "My Heart is in the Highlands" stays on the mind as a haunting re-creation of an old folk song, in English and German versions. But it's all a welcome addition to the Part cannon. When a group such as the Freiburger BarockConsort performs music from the 17th century, you hear the sound of the music as it would have been heard in a typical performance of the period. This they do on a new album covering the music of Johann Heinrich Schmelzer, an Austrian composer very active at the Habsburg court. His sonatas and dance suites became well known throughout Central Europe. 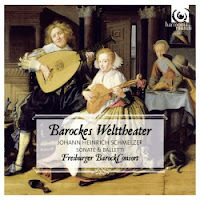 Freiberger's BarockConsort gives us an insightful/delightful earful of a good selection of his instrumental works on Baroque World Theatre (Harmonia Mundi 902087). The presence of lute, harpshichord and viola da gamba, and what sound like period instruments and bows in the violins and etc., transforms the usual modern-day performance into something much sweeter and more resonant. The imitative echoing of motives, the continuo in its original timbral richness and the general string sound bring out the parts. The blend of instruments is distinguished by a greater variety of sound colors than we might hear today and so each part stands out more strikingly. And in the process Schmelzer's music becomes quite comprehensible and rather lovely indeed. And you can hear the influence he had on Biber, for example, in the elaborate and characteristic variations around repeating figured bass patterns. This was something Biber quite apparently studied closely. It's a very attractive performance of works well worth hearing and enjoying. Any fan of early music will love this. Those who may not have heard music of the early baroque performed in the period style with period instruments are in for a good surprise. Some of the dances really get rolling as well! 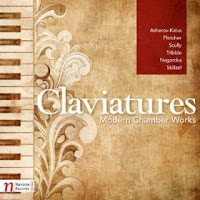 Claviatures (Navona 5864), as the title suggests, centers around the pianoforte as a common element in a series of chamber works. There is a sampling of three short works for solo piano by Ron Nagorcka; there are works for violin and piano by Jim Tribble and James Scully; a tripartite suite for flute and piano by William A. Fletcher; a work for clarinet, viola and piano by Ayala Asherov-Kalus; and finally a piece for violin, cello and piano by Ingrid Stolzel. These are works of an attractive sort. Some are unabashedly tonal and lyrical, like Fletcher's "Three Lines (After Roethke)." Some have a bit of modernist grit, as with Scully's "Bouncing About." None are in the avant camp, though Ron Nagorcka comes close. All are well played by a varying cast of instrumentalists. The most evocative and pleasing of all to me is Ingrid Stolzel's "The Road is All," which has a kind of haunting feeling of lyrical reflection and suspension in time and memory. In the end you have a series of works that go well together, seek to break no new boundaries but have an unassuming freshness about them. Good listening.